Colored Gel Coats dry to a hard sand-able finish. No wax paper, or special tools needed since it contains wax and dries with exposure to air. Includes MEKP hardener. Available in a variety of colors that are designed to match the basic Awlgrip colors. A rough approximation is shown in the dropdown menu when you select a particular part#. The gelcoat you are buying is an Isophthalic, NPG gelcoat with wax additive for an air dry post applied application. Mixing instruction depends on the temperature and preferable dry times. The higher percentage of catalyst the faster it will dry. Air and surface temperature will also affect the drying of the gelcoat. The colder the air temperature, the higher the percentage of catalyst you should use. Do not go below 1/2% or above 2%. I used Awlgrip paint on a repair. I want to go back with gelcoat. Can I sand the awlgrip and apply over the epoxy paint? Normally you could apply Awlgrip over primed gel coat. Usually gel coat should go over other polyester resin or gel coat for good adhesion. I wouldn't recommend putting gel coat over awlgrip. 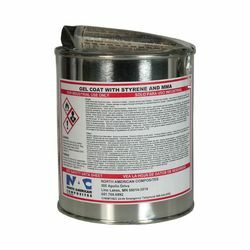 Can this gelcoat be used on top of fiberglass with epoxy, or is it intended for fiberglass with polyester resin? No it cannot be used over epoxy. I messed up and used 2-part epoxy fillersto fill small voids and smoothing out the bottom and polyester gelcoat willnot sure over these areas. I have tried all the tips and tricks and wasnot successful. I will probably try epoxy resin gelcoat with tint to coatmy boat. These gelcoats can be used on top of epoxy as well as polyester resins for cosmetic repairs, but it must be properly and thoroughly cured. We have found that for larger scale work than small cosmetic repairs, using an epoxy barrier coat or tie coat before gel coating improves the adhesion. I have used it to fill in deep scratches on two golf carts I have at work. I hope this helps. The gelcoat on my foredeck and cockpit has numerous small cracks and crazing that I would like to repair. Can I use this product to fill in the cracks after I have ground out and cleaned the surface? I do not want to spray the product on, but rather spread or dispense it with a small syringe into the cleaned surface to seal out moisture. You can V out the spider cracks and crazing with a dremmel or similar tool, and fill them with gelcoat, but depending on the root cause of the cracks, it may only be a temporary cosmetic repair. Hi! We are able to get most colored gelcoats without wax as well. Oyster White without wax is regularly in stock here. Look at the Awlgrip color chart, they match those colors. Can i get a color swag sample to see if I can match up on my boats before I buy? The colored gelcoats match the Awlgrip color pallet. Still, I'd order the necessary tints to go along with your order to get the best match. Oyster white was the closest match for my Dolphin 24, but I got yellow, brown and white tints to fine tune the match for my application. The colors are close to the standard Awlgrip colors. You could call to have a color card mailed to you. Can you lay up multiple coats without sanding between apps. or do you have to let cure,sand clean before nextapplication.1st time gel coating? If the gel coat is set then you must wait for it to cure, sand and clean before next application. It usually sets fairly quickly so it's not like you have to wait a long time. I am currently refurbishing a forest green canoe , my question would be is what do I need to do to paint a different color or even two tone ? This is gelcoat which is used to fill and repair scratches in existing color. If you are repainting then I don't know if this is the best way to go. I'm just a boat owner and have never repainted a boat so I don't know the right answer. Josh,Gelcoat may not be the best product for your project. I'd suggest looking at 1 part or 2 part epoxy paints. Mask between colors with a good quality tape for the two tone paint scheme you desire. do you have a color chart? The colored gel coats at Jamestown match the Awlgrip color chart. I got one from Jamestown several years ago. Still, I'd plan on getting tints ( the small tubes of colorant: yellow, brown, white, red or blue) adjacent to the color you're trying to match for fine tuning. Adjust the tint on a small amount of uncatalized gelcoat, put a dab near the area you're trying to match and wipe it off and readjust if you're not happy with the color. Keep track of how many drops of tint you add so you can replicate in in a larger batch if necessary. My 1986 Catalina 22 was scratched numerous times near the starboard stern. There was a nail extending through the rubrail of a dock where I had it tied. None of the scratches went all the way through to the base fiberglass. but I have a scratched up area about a foot long and a foot high. Will this gelcoat fill those scratches or do I need to apply some kind of filler first and sand the hull smooth before applying? If the scratches aren't too deep, you can sand the entire area to blend fair, clean and dewax, then use a preval sprayer to touch up the entire area. You may need several coats to cover and with air dry gel coat, you'll need to lightly sand between coats. You'll want to order styrene as a thinner for spraying, acetone as a cleaner and white, yellow and brown gel coat coloring agents to fine tune the color match to your boat. ( due to fading, older boats are no longer an exact match to the original factory colors. Adjust the colors to un-catalyzed gel coat, put a dab on your boat and check for color match. If not right, wipe off with acetone, adjust the color and try again. 1 or 2 drops of coloring agents make a big difference. Good luck! Had done some major repairs to my old fiberglass dinghy. Brush applied this gelcoat to the interior of the dinghy. Cured hard everywhere, looks great. Should last far longer than paint. I have purchased this item several times, always works well. Has always preformed well for me. I use it a lot on touch ups as my base color, a little picky on mix but is good. I have an old fiberglass canoe. We did an excellent repair, sand, prep job on it and used this is claret red on the canoe. It is a pretty color BUT CLEAR and you can see all the repairs under it and any imperfections.Even after a few coats. SO if you have a perfect boat and want to reseal it with this I am sure it is great, but not for an old boat with lots of repairs etc. unless you paint fist with an opaque paint and then use this stuff over it and I have no idea what it would adhere to. Jury is still out on this. Chose this product for color match and easy of use. I still needed to adjust the color (not surprising). Was disappointed with the lack of information regarding mixing small batches (a few ounces rather then quart or gallon). Found drying/hardening times very wide ranging and sporadic. Very thin, took 3 coats to hide. The worst. Great product ready to mix and apply. Wish it was in a container that was easier to pour from especially when mixing 1 pint at a time. Otherwise great! So I purchased the Oyster White to use on the bottom of my 20 year old boat because the boat wasn't as bright white as it used to be. My old gel coat was worn through in some spots and the rest was chalky from beaching the boat. I guessed on the color and it was a perfect match. I thought I would spray it with Preval Sprayer but that did not work. I couldn't get the gel coat thin enough. So because my repair was all under the boat(1 foot wide, 8 feet long) I just rolled it with a mini roller. First coat, let dry for a day, light sand, wiped with acetone, rolled a second coat. I sanded that 320, 400, 600 wet and polished. It has a shiny, textured look, but you would think the boat came like that new. Also I used 12 drops of hardener per oz. at 70 degrees, worked perfect. This gel-coat sprays on nice.